BizMojo Idaho: 10%: A Pittance or a Fortune? I have to give a talk next week at my church, St. Luke's Episcopal, about how people ought to shoot for pledging 10% of their income. In light of the shopping frenzy of the past few days, I'd like to raise a question. 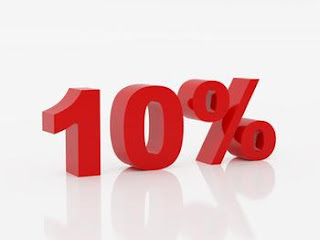 If I owned a store and advertised 10% off all merchandise, how would most people take it? You and I both know it would be considered it a joke. I would have wasted my advertising dollar. There are times when I'm dickering with someone over the price of a guitar and I feel like saying, "How 'bout if I just sell it to you at 10 percent over cost? I don't need a stupid commission. I know you don't need money, and neither do I. Better yet, how 'bout if I just give it to you? Your happiness is important to me." God's grace, of course, is free. Unfortunately, it's a lot more abstract than a wide-screen TV. Full disclosure: Like most people, I have thus far lacked the nerve to tithe. My church is not a place where you hear the word "should" all the time. Happily, I have zero problem paying more than 10% to servers...but by the same token I know that many of them are required to claim they were tipped 10% for tax purposes so when a person doesn't they are at the very least burdening the server and at worst effectively stealing from them (in so far as that server took the time to serve the poor tippers and paid to do for that "honor"). So while it's semi-altruistic, I admit it's not really the same. You have an interesting point, though. Side note...your church is my most favoritest to attend , though I"m not a believer. It's always seemed to be the sort of place that Christ would have approved of. I've never felt unwelcomed or out of place there. It's good people. What time is church these days? I'd like to come see your talk! Thanks, Robyn! It will be Sunday at 10:30. We pride ourselves on our hospitality.